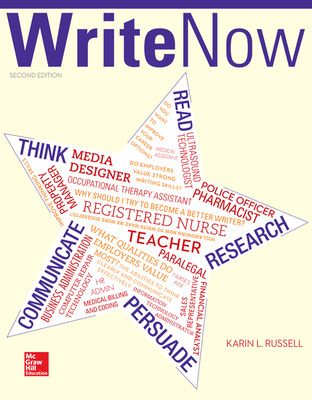 The second edition of Write Now guides students through the process of writing, revising, and editing their work and gives them greater confidence as they approach writing for college, for their careers, or for their everyday lives. Students are offered plenty of practical, hands-on advice for exploring ideas, drafting, revising, and editing for any writing situation they might encounter. Unique to Write Now, the Rhetorical Star is used throughout the text to keep students focused on their writing situation as they draft, revise, edit, and design their work. Now available in the innovative SmartBook format as well as customizable chapters within McGraw-Hill’s CREATE, the second edition of Write Now guides students through the process of writing, revising, and editing their work and gives them greater confidence as they approach writing for college, for their careers, or for their everyday lives. The SmartBook version provides students with an adaptive reading experience, assists them in long-term knowledge retention, and prepares them for active in-class participation and writing assignments. The second edition offers students plenty of practical, hands-on advice for exploring ideas, drafting, revising, and editing for any writing situation they might encounter. Spotlights — Graduate Spotlights provide testimonials from real college graduates that emphasize the importance of writing skills in their careers. New to this edition, Employer Spotlights give students additional insight into the importance of writing in the work world. A Wide Variety of Reading Selections— Professional and student essays span numerous areas of interest and disciplines, providing opportunities for students to apply critical reading strategies as well as topics and models for their own writing. An adaptive learning experience — The SmartBook version of Write Now reinforces key writing concepts for students in an engaging, interactive learning environment. The Annotated Instructor’s Edition includes classroom tips, tips for using SmartBook and LearnSmart, and answers to activities and Grammar Window exercises. Rhetorical Star — unique to Write Now, the Rhetorical Star is used throughout the text to keep students focused on their writing situation as they draft, revise, edit, and design their work. Career-Based Writing Examples — each chapter in Part 2 includes at least one career-based writing example, as well as a section explaining how students will apply each writing strategy in school, in their careers, and in their personal lives. The Instructor’s Manual provides a wealth of material to draw on, including the following: Chapter outlines, Lecture notes, Class activities, Sample assignments and writing topics, Discussion Questions for Online/Hybrid Classes, Graphic Organizers that can be used as handouts, Grading rubrics for each type of writing covered, and Peer review worksheets. — Interpreting an Advertisement: Endless Sands. Pure Waters. Karin Russell is a college English teacher whose experience in helping students achieve success has spanned more than twenty years. Russell earned her undergraduate degree in Elementary Education at Stetson University and her master's degree in Reading and Language Arts Education at The Florida State University. She continued her education in the English field by earning thirty-six graduate credit hours beyond the master's degree. She has taught composition and literature courses for various Florida schools, including Brevard Community College, Nova Southeastern University, and several career colleges. For more than fifteen years, Russell has been a full-time English instructor for Keiser University, where she is the University Department Chair for English, humanities, fine arts, and communications. She oversees curriculum development for a variety of writing, literature, and communication courses. She has been named an Instructor of Distinction four years in a row. She also serves as a member of the assessment committee and the Keiser Writes leadership team and as a faculty advisor to Phi Theta Kappa, a student leadership organization. Russell is especially interested in enabling students to develop their writing skills through a process-oriented approach and showing students how writing is applicable to their future careers. She passionately believes that nearly anyone can become a good writer with the right instruction and enough practice. On a personal note, Karin Russell loves spending time with her loving husband, Todd, their amazing son, Cody, and their wonderful rescue dogs and cats. She also enjoys creating stained glass art pieces, riding her motorcycle and scooter, traveling about the U.S. in her family's RV, and reading multicultural novels.